You’ve invested a lot in your swimming pool or spa, and you know it is important to have regularly-scheduled, professional maintenance. But what should you do in between your scheduled service? We’ve got some tips for you. When you are using your pool or spa a lot, you’ll definitely notice the water getting a bit more hazy, and looking less welcoming than usual. Here are some tips to keep everything looking fresh and clean. Use tennis balls. Yes, that’s right, tennis balls. When you’ve had a pool party or a big group in the hot tub, there are a lot of extra oils in the water, ranging from body oil to suntan oil, to things you probably would rather not know about. The fuzz on the outside of tennis balls attracts and grabs onto a surprising amount of those oils. Just float them on the surface and let them do their job. Get shocking. Don’t hesitate to occasionally shock your pool or spa with a larger-than-usual amount of chlorine. The label on the treatments you use should include instructions for how, and when, to shock your water into ultra cleanliness. You’ll want to stay out of the water for a day or two, but it’ll be well worth it once you see the results. Try baking soda. When you need to do some spot cleaning or want to balance the PH in your water without adding a bunch of chemicals, try a little baking soda. It won’t hurt anything, and is virtually the same PH as the products you’ll pay a lot more for that contain a bunch of extra chemicals. Skim it. Regular skimming keeps the surface of your pool free of debris, and goes a surprisingly long way toward keeping the walls and bottom of your pool clean as well. If daily skimming is too much for you to take on, consider paying a neighborhood teenager to take on the job. Check the filter. Your pool’s filter does the hard work every day of keeping nasty bacteria and other unwelcome critters out of your pool. Follow the manufacturer’s instructions for regularly cleaning and replacement of your filter. Keep your pool pooch-free. Unless you are planning an annual service and deep-cleaning in the next few days, it is best to just keep the dog out of the pool. We know fido loves the water. But the hair, dirt, bacteria and other unwanted junk they add to the water can create maintenance nightmares. Keep it clean. We’re not sure that this first one is an actual maintenance tip, but it will help keep your water cleaner. Rinse off before getting in. There’s a lot less water in your spa than in your pool, so any body oil, lotions and powders build up really quickly. Any shampoo that didn’t get rinsed out in the shower, is sure to end up in the spa. Bleach it. Use a 10 percent bleach solution to take care of mold and mildew on the inside of your spa cover. It isn’t very pleasant to be sitting in the spa with the smell of mildew wafting past. A soft brush with a bleach solution used once a month or so will keep your cover clean. Drain it. 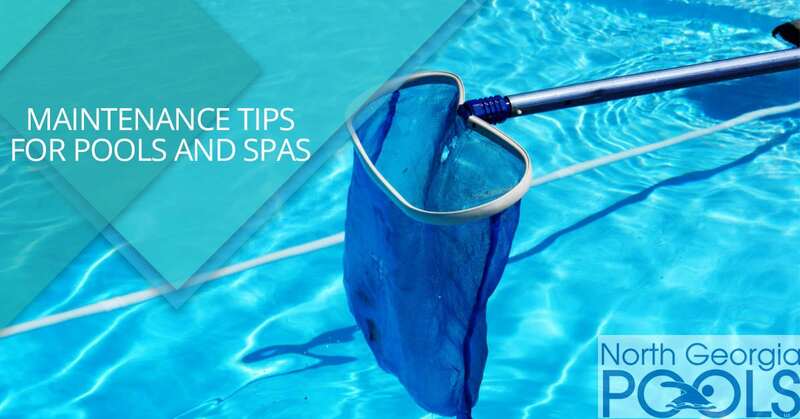 One of the reasons spas use so much water is that they really do need to be emptied and refilled once in awhile to keep them clean and keep you safe from anything nasty that might be growing in the water. Plan on emptying, cleaning and refilling your spa about four times a year. Call us year round for help with maintenance or repairs. We’re your North Georgia pool and spa experts.